How much fun would it be if you room had a big Mockinjay symbol on the wall? If you are a Hunger Games fan then you probably love that idea. Now you can have a big Mockingjay decal for on your wall. This wall decal is easy to attach to most flat surfaces and you can remove it without damaging the wall. 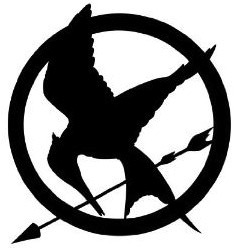 With a size of 14.5 x 13.5 inch this Mockinjay decal will be a nice focuspoint for you room. The Mockinjay is black without any more details and that is perfect as now it will be there but not take all the attention away from other things. Start decorating your The Hunger Games room with this Mockingjay Wall Decal.